The Associated Press asked all 295 Washington school districts plus tribal districts whether they test for lead in the water. Of the 174 districts that responded to AP, nearly 40 percent said they do not do test for lead. Many small districts do not test. But instead of putting $5 million in the state’s budget to pay for lead testing inside public schools, Washington’s Legislature has left school districts to their own devices on this health and safety issue. The Associated Press asked all 295 Washington school districts plus tribal districts whether they test for lead in the water. Of the 174 districts that responded to AP, nearly 40 percent said they do not do test for lead. 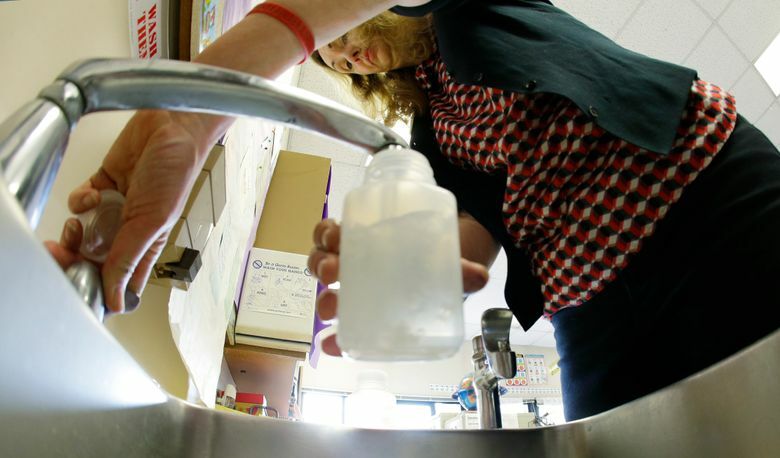 Most big, well-funded districts test their water. Many small ones do not. And of the 106 that reported they do lead testing, 28 districts started after the Tacoma Public Schools revealed last month that 13 of its elementary schools have tested positive for lead in drinking water. About 60 percent of Washington school districts that responded to an Associated Press request for information about whether they test their school drinking water for lead. “Unless you test, you do not know,” said Randy Dorn, Washington state’s superintendent for public instruction. Dorn says this is clearly an equity issue, among the many ways Washington’s education funding system is unfair. It’s one more reason why the Supreme Court’s McCleary decision on school funding is so essential, he said. “My guess is with the media coverage, most schools will be testing now,” Dorn said. Dale Bonfield, superintendent of the Asotin school district in the southeastern corner of Washington state, says there are a lot of things the state doesn’t pay for, like lead testing, but that doesn’t mean they aren’t important to the health and welfare of his 650 students. “To try to do everything that needs to be done and done with the amount of money you have is a very difficult task,” Bonfield said. Bonfield says he’s looking into getting the five water fountains most used by students tested in the near future. Since they’re only doing limited testing in their three school buildings — built in the 1950s and 1970s — it will cost just about $200. Dorn blames the Legislature and the governor for not finding the money to pay for testing, although Gov. Jay Inslee announced last week he would make testing a higher priority. No states require schools to test their water for lead, although the Michigan Legislature is currently considering several proposals, according to Doug Farquhar, program director for environmental health at the National Conference of State Legislatures in Washington, D.C.
There’s no federal mandate for school water testing under the Safe Drinking Water Act. Childhood lead poisoning can lead to learning disabilities, decreased muscle and bone growth, behavior problems and speech and language issues. Farquhar said that because of the lead water crisis in Flint, Michigan, this issue is currently on the minds of lawmakers. “With Flint, everyone’s kind of refocused their attention,” Farquhar said. Washington’s Department of Health decided in 2009 that testing water for lead inside public schools would be a good idea, but money to pay for it was caught up in a legislative fight over budget cuts. The department proposed a rule which also requires testing for mold and other environmental hazards at a total estimated cost of $45 million, but it can’t be enforced until the state pays for it. That money has never materialized. Two of the state’s three largest school districts — Seattle and Tacoma — have found lead in the water at some of their schools. The third, Spokane, has not tested its school drinking water since 1999, but just began testing again. Of the three largest districts, only Seattle has a regular testing program, which it started more than a decade ago. The state’s largest school district found lead above the EPA threshold for schools in some of the drinking water at about 35 schools in 2006. Among those districts that test, 24 percent have found lead above the level at which health departments require action, which is between 15 and 20 parts per billion, depending on which guidelines are followed. Some districts that don’t test their water said they have all new school buildings so the chance of finding lead inside is low. Health laws require local water systems to test regularly for lead and other contamination. But once that fresh water flows through old pipes and fixtures, lead could become a problem. Although the state Health Department estimated in 2009 water testing for lead in public schools would cost up to $2,270 per school or about $5 million for the entire system, the test results would likely lead to more costs down the line, from replacing a drinking fountain to retrofitting an entire building water system. Inslee last week ordered the state Department of Health to bring a proposal to the Legislature to pay for water testing. The legislative session begins in January. The Senate’s lead budget negotiator Andy Hill, a Republican from Redmond, said he couldn’t promise money in the Republican budget until the estimated costs are updated and he can see how they fit in with the larger state budget. But he said safety of children is a top priority. The House’s new budget writer, Rep. Timm Ormsby, D-Spokane, said House Democrats can guarantee money to test school drinking water for lead would be in their budget proposal. A spokesman for the state teacher’s union agreed with Dorn that testing for lead in public schools is an equity issue.